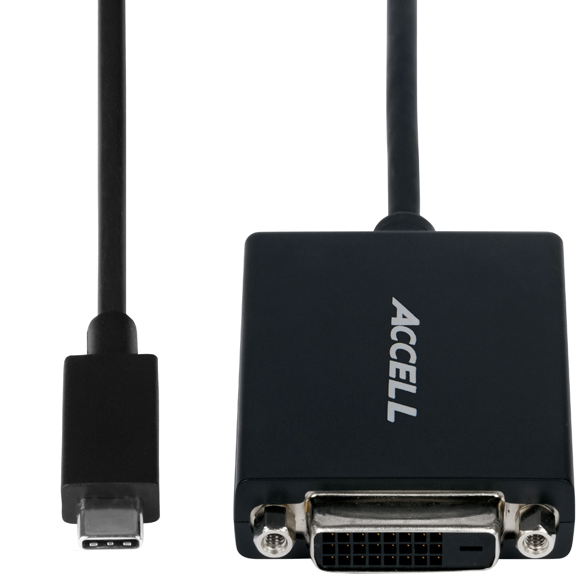 The Accell USB-C to DVI-D Adapter converts a computer's USB-C port into a DVI-D single-link output. The DVI video adapter is compact and highly portable. Powered by the device's USB-C port, the adapter requires no external power making it perfect for use with mobile devices. The DVI adapter enables you to expand your USB-C device's screen onto a DVI-D supported projector or display. Compact and portable, easily carry the adapter whenever you travel. The DVI adapter is ideal for business use when presenting with a projector. Increase productivity by using an additional display with your USB-C enabled computer. With an expanded screen, multi-tasking will be more efficient, as multiple application windows can be conveniently accessed. The USB-C to DVI Adapter supports all USB-C devices with DisplayPort ALT mode and operating systems, including Mac, Windows and Google. For this DVI video adapter to work from a USB-C port, the USB-C port must support DisplayPort Alternate (ALT) mode. Please check your device's user manual to confirm the abilities of its USB-C port.